A dozen or so young citizens wanted to have a stage show once in a while. They started with a minstrel. The shows were a success with plenty of talent and a desire to “Put the town on the map”. After World War I, the show had outgrown the Methodist Church, the loft over the Burgess Garage, the Masonic Temple and the school auditorium all put together. They needed a bigger playhouse. The group started by purchasing the Lahser home. They spoke of a theatre that would seat 1,000 people, but many thought it would be too large. Potential theatre lessees said it would be too small to interest them. There would be additional obstacles and delays. E. B. (Gene) Wilhelm invited the directors of the Redford Investing Co. (the organization holding the property) to lunch at Allen’s Garden (which billed itself as “Michigan’s Finest Eating Establishment”) and was located at Grand River and Five Points, and suggested a plan for financing, leasing and building a theatre seating over 2,000 people. After nearly ten months of stormy obstacles, contracts were signed and ground broken for the new building. Financing was arranged through Bachus Fordon Co., Detroit Trust Co., and Harry Lush of Plymouth. Architects were Verner, Wilhelm & Molby of Detroit. Contractors were John H. Patterson of Plymouth. Lessees were the John H. Kunsky Co. for the theatre and Harry Lush for the offices and stores. A watercolor painting, depicting the auditorium north wall, is prepared to convey the proposed interior design to prospective interior decorating companies. Original surface treatments indicated in the blueprints were changed during the preparation of the water color painting. This is evident in the underlying pencil work in the painting. (Painting now hangs in the lobby of the Redford theatre) For four weeks new ushers, from the Redford schools, were trained under the strict expertise of the Kunsky Service in military tactics and theatre etiquette. The efficient service system of the Kunsky Theatres was recognized as one of the finest in the country, and widely copied. Community businessmen, professionals and neighborhood set up for the grand opening, a week of celebration called “Greater Redford Week”. The streets were decorated, stores in gala dress and the entire community taking part in various events to emphasize the life and activity of the suburb. During a parade on Grand River, a 16mm movie film is shot. The film featured views of Grand River & Lahser plus the Redford Theatre marquee, a close-up of some people standing beside the box office at the theatre doors, and a limited view of the Grand Foyer (north end 1st floor) with water fountain & oriental cabinet is visible. This film was a promotional item for Risd on Dairy. “Bob-O-Link” was the first occupant of the theatre store front south of the theatre entrance. It had a rolling pop-corn & candy cart on the sidewalk. Smiley Drug Store on the corner of Grand River and Lahser began selling candy in a “theatre package”. The Haller Bakery, motto: “Pure foods with efficient service” at 17322 Lahser Avenue offered to “Check your parcels here while attending the new Kunsky-Redford Theatre.” Final Cost of construction and furnishings $500,000 ($6,786,474.00 in 2015). 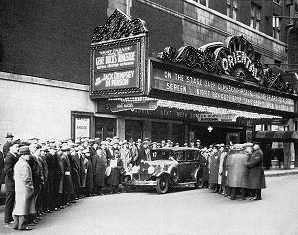 Grand Opening of the “Kunsky Redford Theatre” on Friday January 27th of 1928. Outside the theatre, the street was aglow with the brightly lighted vertical sign and marquee studded with over 2,000 multicolored light bulbs. Two school children, a boy and a girl, winners of an essay contest, had the honors of cutting the red, white and blue ribbon stretched across the foyer and admitting the waiting crowds. A revolving 7,000,000 candlepower aircraft beacon sent its beam in every direction fr om a 6 foot tall tower mounted on the tallest part of the building. Once inside the auditorium, the audience was transported into a Japanese garden. The organ chambers were like pavilions on either side of the proscenium. 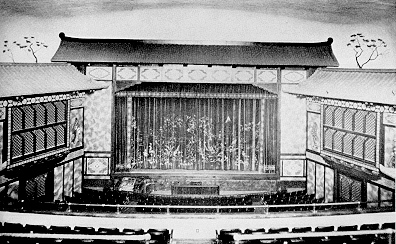 The proscenium arch and the chambers were each capped by a pagoda-style tile roof. Overhead, a deep blue sky was sprinkled with stars while fluffy clouds appeared to float by. Throughout the theatre were colorful Japanese murals and stenciled designs. On either side of the organ grilles were Japanese figures in oriental dress. To crown all of this was a splendid 3 manual 10 rank Barton pipe organ console. A magnificent sight indeed, in black and gold, complete with Japanese dragons.The opening program included vaudeville, the silent film “The Gay Defender” starring Richard Dix and Thelma Todd, a newsreel and a sing-along. The organist for opening night was Don Miller, on loan from the Detroit Capitol Theatre (Now the Detroit Opera House). Carbons (for the carbon arc movie projectors and spot lights) were borrowed from the Great Lakes Theatre for opening night, due to insufficient supply. (quoted from one who was the Great Lakes Theatre manager at that time.) 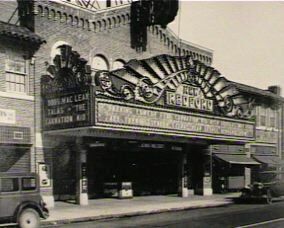 The Redford Theatre has continually used carbon arc illumination for the projectors and follow spotlight from the opening night until the present.Theatres originally did not have food concession counters, and restroom facilities were quite minimal. Excerpts from a newspaper article in the Detroit Times: “Revolving Search Light on the roof… Official Airplane Beacon … Rays cast to many miles … Community Trademark”. The theatre was heated by four coal-fueled forced air furnaces. Â Twenty-four persons were needed to operate the theatre: manager, assistant manager, organist, cashier, ticket taker, projectionist, house fireman, three janitors, one maid, 12 ushers and one engineer to operate the heating and cooling systems. Admission was 30 cents for adults and 15 cents for children. Â Evening shows began at 7:00 and continued until 11:00. Weekday matinees at 2:30 were 20 cents for adults and 10 cents for children. Weekend performances were continuous from 2:00 p.m. to 11:00 p.m. The Oscars winning, “Wings” starring Clara Bow, Richard Arlen and Buddy Rogers opened at the Redford Theatre. “Wings” was the only film to ever win the Best Picture Production and Best Engineering Effects Oscars. Photographs are shot by Manning Brothers. These four black & white photos were originally for insurance & promotional purposes. The photos are reproduced on several pages of this web site. The four furnaces are converted to oil fuel by Mobil Oil. A fifth photo is shot viewing the southern side of marquee for Mobil Oil to use on their promotional brochure which proclaimed, “Largest structure in area converts to oil fuel.” (this brochure has not yet been located for files) The furnaces were converted to natural gas at a later date. The furnaces were retired from service and removed in the 1990’s. They were replaced by a single gas-fired boiler which heats steam coils placed in the duct work. The draperies and tassels in the Grand Foyer are removed for safety reasons, due to kids jumping in the stairways to get tassels on the drapes swinging. Two tapestries, antiques when installed, were removed due to frayed material from too much touching by the patrons. These were substituted with wallpaper of oriental design. Located in large square panels on each grand stair landing wall panel. Cloud Machines (2) disappeared presumably around this time. Located on the roof of each organ chamber, these projected images of clouds floating across the sky blue (sky) ceiling. Theatre manager has been observing the street vendor who now has a bigger popcorn cart and additional merchandise. The theatre tries a concession stand in the north end of the storm lobby. The concession stand was profitable, but the location created a traffic flow problem with those coming back out of theatre, past the ticket takers to get more food, then merging with those entering theatre. Compounded problems are created if one claims to lose their ticket stub or a friend inside has it. So, the concession stand was relocated to south side of Grand Foyer. A hole was made through the wall to accommodate soda pop lines to pop tanks in store room under grand stairs. Marble shoe molding is chopped out and an electrical outlet added.Grand Drape removed around this time due to wear. Grand Stairs square panels are wallpapered again, this time with a flower pattern.Men’s lounge area is used for restroom facility expansion.Ladies restroom also expanded to double its original size. Pearl Harbor attacked by Japanese. This event had a profound effect on the interior and exterior of the Redford Theatre. Most of the references to Japanese culture were removed or painted over. What happened to many of the fixtures and the furniture, is still unknown. Approximately 54 glass panels (3 styles) from the original Grand Foyer (3) chandeliers were saved in a box. These were found stashed in a storage area above the dressing rooms and were used to help determine the decorations to be used on new glass panels for the current chandeliers. Iron was desperately needed for the war effort, so the vertical marquee sign and its massive iron supports were removed for war scrap iron. The forties also saw the organ fall into disuse. Although the organ was no longer in use, it remained intact and relatively undamaged. Entire theatre is scheduled to receive a face lift. Fortunately, only the marquee and theatre entrance are modified. Additional proposed plans never carried out. Blueprints and a drawing confirming these plans are on file. Exterior entrance area and box office receive new surface panels with the appearance of corrugated blue and silver sheet metal curved at front corners. The marquee is modified and an I-beam is installed over new entry doors to support marquee and upper structure. Two propeller shaped neon lights, blue and pink, were mounted above entrance. The storm lobby and box office inner extension removed. New showcases & wall paneling installed. New Lounge signs replace originals. Interior surfaces are repainted. Seating capacity reduced to approximately 1200 supposedly due to projectionist union guidelines. Union contracts tied the number of projectionists and their salaries to the seating capacity of the theatre. Seats were removed from both the main floor and the balcony. On the main floor, the remaining rows of seats were spaced further apart, providing additional leg room. The balcony, with its “stadium” seating, saw the removal of seats from uppermost rows. The Redford Theatre is purchased by the Goldberg family and becomes part of their “Community Theatres” chain. The theatre was repainted once again. Gold drapery is installed over the organ chambers instead of repainting. Exterior entrance area again receives new surface panels. Gold stone is installed over 1949 panels. Motor City Theatre Organ Society, local chapter of the American Theater Organ Society (then known as American Theatre Organ Enthusiasts), receives its charter at a meeting held on October 15. The group got its start as a part of the Detroit Theatre Organ Club. DTOC was formed to remove the organ from the Fisher Theatre and install it in another location. After the organ’s installation in the Iris Theatre, DTOC decided to move the organ again, this time to its current home in the Senate Theatre. Many local organ fans retained memberships in both MCTOS and DTOC. MCTOS begins the restoration and maintenance of the Redford Theatre’s Barton organ, following the granting of permission by the owners. After-midnight organ concerts were being given following the last showing of the day’s film. During organ concerts, gold drapery is parted from the organ chamber openings to reduce sound muffling. A series of Sunday morning concerts was gradually established. The first Sunday of each month was at the Redford, the second Sunday at the Ann Arbor Michigan Theatre Barton, the third Sunday was the Punch & Judy Theatre Wurlitzer and the fourth Sunday of each month was at the Royal Oak Theatre Barton. These concerts featured local volunteer artists. Occasional concerts were held at the Fox Theatre and the Detroit Theatre Organ Society had a regular schedule of concerts at the Senate Theatre’s Wurlitzer. Don Miller, the organist who played for opening night, gives an early morning concert at the Redford. 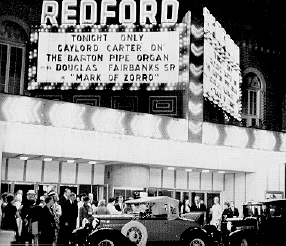 Gaylord Carter plays for the first public show to be presented by the Motor City Theatre Organ Society at the Redford Theatre. In addition to Gaylord’s artistry in accompanying “The Mark of Zorro,” vintage cars were parked outside the theatre and some members were dressed in ’20s attire. An upright piano, playable from the organ console, is added and placed on the right side of the orchestra pit. Community Theatres, which owns and operates the theatre, no longer considers the Redford to be a profitable venture. They asked MCTOS if the group was interested in leasing the facility. MCTOS decides to lease the Redford Theatre at a membership meeting held on October 13. Plans to lease the Redford Theatre were finalized at the annual membership meeting on November 3. Community Theatres, expressing their desire to sell the Redford Theatre, gives MCTOS the first option to buy for $125,000. A membership meeting was held and, after many heated discussions, the majority voted “YES”. MCTOS signed a 10 year land contract to buy the theatre and related properties, thereby assuring a permanent home for the Barton organ and MCTOS. Fundraising was begun to raise money. Many members donated amounts from $25 to $1000. Other ideas were tried but it became apparent that organ shows and fundraisers would not be enough to support the purchase and operation of the theatre. While exploring the various means of securing a steady source of income, the idea of a classic movie series was born. A down payment was made on November 7, 1977. The projection booth is updated with Norelco 35/70mm projectors from the Pandora Theatre (previously known as the Summit Cinerama Theatre and originally named the Cass Theatre) where demolition was in progress. This gave the Redford the capability of showing 70mm films. The movie series proves to be a successful way to raise funds for the operation, purchase and renovation of the theatre building. In less than a year sell-out crowds are coming to the Redford. Chandeliers of oriental design from the same era as the Redford Theatre were found in what was the lobby of the Detroit Oriental Theatre (later named the RKO Downtown) but needed to be restored. The theatre had been demolished many years ago, but the lobby remained hidden in the lower portion of an apartment building structure. The chandeliers were donated to the Redford Theatre. Following restoration, in December of 1981, they were installed in the grand foyer of the Redford Theatre where their glow would be appreciated for years to come. Walls, added in the late 1940’s, are removed to reveal decorative plaster grille work under the organ chambers. On January 2, 1985 a check for $55,000 was presented to the Goldbergs to fulfill the land contract on the theatre. This made MCTOS the free and clear owners of the 1661 seat Redford Theatre, its Barton Organ, office building, storefronts and parking lots. 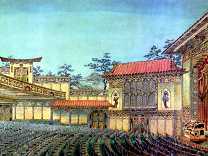 The purchase of the theatre was accomplished without grants or corporate subsidies. Theatre restoration begins as Director of Restoration is voluntarily drafted from staff volunteers. Paint stripping in the grand foyer removes 1 to 7 layers of paint to reveal the original 1927 layer of decorative stencils on walls and ceilings. The designs are traced and the colors are matched. Stencils are cut and later reapplied, just as they were in 1927. Paint is also removed from maple wood railings and marble moldings. Restoration of inner lobby 95% complete. Parking lots are repaved. 1920’s-style, Lounge and Exit signs are fabricated and installed. The entire theatre is recarpeted. A remnant of the original 1927 carpet is saved from a stairway. Restoration commences in the auditorium. Twelve painted designs have been revealed with an additional 5 or 6 yet to be uncovered. Thanks to a generous donation from the Redford Community War Memorial Association, the original 1927 Bull Dog light board is replaced with a new computer-controlled light board. Restoration of the auditorium resumes with the repainting of the walls in the original design. A full internet web site is developed at theatreorgans.com/mi/redford and ready for use in June. Like most other things done at the Redford, it is totally a volunteer effort. Repainting of the auditorium walls continues at a rapid pace and all but the most unreachable areas are completed. Work on the lobby areas also proceeds with the painting of the ceiling in the outer lobby and the painting of the doors between the outer lobby and the inner lobby. The yellow and white Formica concession counter is also painted to match the inner lobby walls. The 70th Anniversary Celebration Night is a big success. The program includes: the Hotel Savarine Society Orchestra, John Lauter at the console and Buster Keaton’s “Our Hospitality” accompanied by Tony O’Brien. The entire Redford Theatre, including the lobby, becomes a non-smoking area. The application of stenciling to the auditorium walls is started. Replicas of the original wall sconces are produced and one is mounted on the auditorium wall to test the longevity of the design. The American Theatre Organ Society recognizes the historic nature of the original installation theatre organ in the Redford Theatre. The original hardwood and softwood floor of the stage is covered with Masonite flooring to provide a more modern performance surface for shows. Additional wall sconces are completed and installed. In true MCTOS Redford tradition, the project is completely a volunteer effort. A control booth area for sound and lighting is constructed at the rear of the main floor. Seats are also removed to provide a wheelchair area. A grant is received from the State of Michigan which covers a large percentage of the costs of replacing all the seats on the main floor and the loge area of the balcony. A portion of the suspended ceiling in the lobby is removed to reveal the original decorative plaster work. February 25 – an e-mail group was established on yahoo.com to provide timely updates of MCTOS news to members. A public e-mail list was created on October 3 to publicize events at the Redford Theatre. Plans are finalized for the installation of the new seats and the refinishing of the floor. Restoration work continues on the underside of the balcony. Work continues on fabricating and installing the replica wall fixtures. In December, the old seats are removed. The removal of the seats provides an opportunity for the repair and restenciling of the inside and outside of the front balcony wall. While the main floor and loge floor are being refinished and new seats installed, the best seat materials from the main floor are used to upgrade the seats in the upper balcony. The stairs leading to the stage from the orchestra pit area are removed for safety reasons. Painting on the side walls is completed. Seating capacity is reduced to 1571 with the installation of new seats and wheelchair areas. Programming resumes at the theatre on schedule.The organ console restoration project began while the theatre was closed for the seat installation. The outside of the Barton was showing signs of wear and tear after 74 years of use. A year long effort on the part of Donald Martin and several family members saw the console top and sides returned to a like-new appearance. During the console restoration, it was given a temporary cardboard skin so that the organ could still be played and became affectionately known as the “Carton Barton.” The newly refinished exterior made its debut at the 2002 Christmas show. The MCTOS/Redford Theatre receives its own internet domain name, redfordtheatre.com, making it easier for web surfers to find our website. January 27, 2003 marked the 75th anniversary of the opening of the theatre. A number of special activities are scheduled throughout the year to mark the diamond anniversary of the building. A special celebration was held on April 5 to commemorate the landmark birthday. Auditorium restoration continues with the application of stenciling below the organ chambers. Work begins on restoring the outer lobby. The wood paneling was removed from the walls and the drop ceiling was removed to reveal the original plaster and stencil designs. Following repairs to the plaster by professionals who donated their time, volunteers repainted the ceiling and walls. Following that, the volunteer restoration crew applied the stenciling to the ceiling. Designs for wall sconces and ceiling fixtures were developed. The Seat Replacement Fund continues to grow and nears the goal of being able to move forward on finishing the project. A series of extremely generous anonymous donations over a period of several years plus the Sponsor A Seat Campaign make the replacement of the seats a reachable goal. In true MCTOS fashion, the project will not be started until the money is in hand. A kind donation of projection carbons provides the Redford Theatre with a several-year supply of those increasingly hard-to-find consumable objects. This will enable us to continue to present movies in the way they were originally intended. January 27, 2008 marked the 80th anniversary of the opening of the theatre. A gala celebration was held on April 19 to commemorate “80 Years Under the Stars.” The system of miniature Christmas lights that had provided the starlit atmosphere for 30 years was replaced by a fiber optic system. Approximately 10,000 feet of fiber optic strands were routed through the ceiling. Water-damaged areas of the auditorium ceiling and walls were repaired by professional plasterers.Plans to renovate the concession area in the inner lobby begin. The amount needed to replace the seats is nearly reached. Bids are sought for refinishing the floor before installing the seats. New stage drapes were purchased through funds earmarked for restoration. The need for a digital projector is established and plans are made to raise the funds to purchase one. Approval is given to upgrade the auditorium sound system. Concessions area renovations were completed and outer lobby restoration continues. Although Michigan is experiencing tough economic times and many entertainment venues have to contend with dwindling audiences, attendance at movies increases. A new ticketing system was purchased and made operational. A visit by actress Mary Badham who starred in “To Kill A Mockingbird” gets 2011 off to a good start with attendance topping 2000 for the first show of the year. A program of purchasing new stage lighting fixtures was started. Upgrades were made to the projection sound system with the installation of a Dolby CP-200 Cinema Processor and the purchase of new sound readers for the projectors which enable the decoding of digital sound tracks, and the playing of cyan and traditional optical sound tracks.